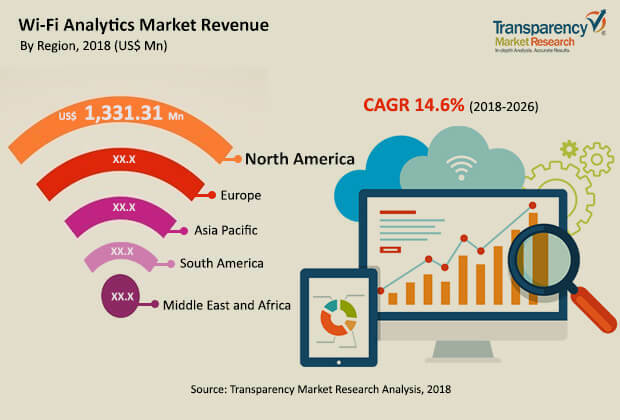 According to a new market report published by Transparency Market Research titled “Wi-Fi Analytics Market– Global Industry Analysis, Size, Share, Growth, Trends, and Forecast, 2018–2026”, the global Wi-Fi analytics market is expected to reach US$ 9,461.0 Mn by 2026, expanding at a CAGR of 14.6% from 2018 to 2026. North America held a prominent share of the Wi-Fi analytics market in 2017 and is projected to be at the forefront of global demand, and the market in the region is expected to expand at a significant CAGR among all regions. Wi-Fi analytics solutions help in using the information available through the wireless network to gain detailed insights about visitors and make better informed decisions about the physical space. It provides information about the locations visited, in which order, and time spent in each location. It offers an easy option to study, understand, and analyze the demographics of the population that uses the Wi-Fi services. It gives a point of entry to gauge the propensities of the users, their location, interests, and search interests. Hence, several industries use Wi-Fi analytics to tabulate key consumer data and use it to make informed decisions. The Wi-Fi analytics market can be segmented based on deployment, end-user, applications, and geography. Based on type, the Wi-Fi analytics market has been segmented into on premise and cloud/SaaS model. The demand for cloud based model is due to its lower cost as even small coffee shops or a mid - size restaurant can easily subscribe to it without putting pressure on their monthly budget and it entails zero management from the customer’s end. Also, cloud based models require zero maintenance from the customer, thus reducing huge maintenance costs involved. Based on end-user, the Wi-Fi analytics market has been divided into retail, automotive, hotels/restaurants/ motels, stadium, airports, enterprises, hospitals, government, and others. In terms of application, the market has been divided into marketing and advertising, network management, and access control and security management. Marketing and advertising is expected to hold the largest market share in 2026. This growth is due to the growing awareness about Wi-Fi marketing. Various brick and mortar stores are now deploying location based analytics solutions to promote and advertise their product offering. In fact, today all the big retail stores, restaurants, hotels, and coffee shops have their Wi-Fi marketing strategy in place. Based on geography, the global Wi-Fi analytics market has been divided into North America, South America, Europe, Asia Pacific, and Middle East & Africa. North America is expected to hold a prominent share and account for more than 40% of the global market in 2026, followed by Europe. The growth in the North America region is due to greater adoption of Wi-Fi analytics software for formulating and implementing advertising strategy. The U.S holds the larger market share in the North America region because of large number of hotels, restaurants, motels, QSR, airports, and stadiums in the region. Also, availability of free Wi-Fi spots across the U.S. is driving the growth even further. The market in the Asia Pacific region is expected to grow at a faster rate globally due to growing adoption of Wi-Fi analytics solutions among significant number of stores and restaurants in the region. As a part of the strategy, several vendors are investing in tools development specific to a particular application and are focused on establishing new partnerships, and mergers and acquisitions in order to increase geographical reach in the global Wi-Fi analytics market. Major players operating in the global Wi-Fi analytics market include GoZone WiFi, Purple, July Systems Inc., Bloom Intelligence, Cloud4Wi, Inc., Ruckus Wireless, Inc., Cisco Meraki, and Hughes Systique Corporation. Comparison matrix includes segment growth matrix, 2016– 2026 (%), segment revenue contribution, 2016 - 2026 (%), and segment compound annual growth rate (CAGR %). Market attractiveness identifies and compares market attractiveness of segments based on CAGR and market share index across North America, Europe, Asia Pacific, Middle East & Africa (MEA), and South America.